One of the features that we have explored in our project is the application of the experimental method in areas other than natural philosophy. I have focused on the work of George Turnbull to illustrate how the method was applied in moral philosophy and religion. In my next series of posts I want to focus on the work of Joseph Butler (who was arguably one of the figures that most influenced Turnbull) and explore his ideas on method in moral and religious inquiries. As an introductory post to this series I will focus on the preface that appeared in the 1788 edition of Butler’s Analogy of Religion (first edition 1736) by Samuel Halifax, Bishop of Gloucester. In this preface Halifax gives an account of Butler’s ‘moral and religious systems’ that serves as a summary of Butler’s main ideas. What the inward frame and constitution of man is, is a question of fact; to be determined, as other facts are, from experience, from our internal feelings and external senses, and from the testimony of others…From contemplating the bodily senses, and the organs or instruments adapted to them, we learn that the eye was given to see with, the ear to hear with. In like manner, from considering our inward perceptions and the final causes of them, we collect that the feeling of shame, for instance, was given to prevent the doing of things shameful; compassion, to carry us to relieve others in distress; anger, to resist sudden violence offered to ourselves. 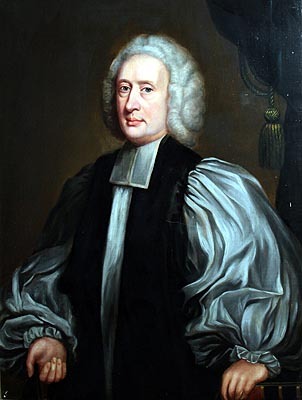 The reader will observe, that this way of treating the subject of morals, by an appeal to facts, does not at all interfere with that other way, adopted by Dr. Samuel Clarke and others, which begins inquiring into the relations and fitness of things, but rather illustrates and confirms it. It is interesting that Clarke is portrayed as following an a priori method in his moral inquiries, and I will leave the analysis of this and its relation to Butler’s method for a future post where we will examine the correspondence between Butler and Clarke regarding this issue. Since this is just an introductory post, I want to finish by showing Halifax’s rendering of Butler’s method in his religious work. One of the advantages of this method of analogy is that (as we will see in my next post where we examine Butler’s Analogy in a bit more detail) it does not lead to a claim of certain knowledge about the doctrines of religion, but it rather leads to a high degree of credibility in them. This feature allows Butler to get rid of a number of objections. Further, if the analogy Butler argues for is a strong one, then all objections made against revealed religion will also count as objections to natural religion, which is a consequence the objectors will not want to admit. Instead of indulging to idle speculations, how the world might possibly have been better than it is; or, forgetful of the difference between hypothesis and fact, attempting to explain the divine economy with respect to intelligent creatures, from preconceived notions of his own; he [Butler] first inquires what the constitution of nature, as made known to us in the way of experiment, actually is; and from this, now seen and acknowledged, he endeavours to form a judgment of that larger constitution, which religion discovers to us. In my next post we will examine Butler’s application of this method in his Analogy and his defense of probable knowledge. He was a gifted instrument maker who not only developed a new much improved design of Robert Boyle’s air-pump, but also conducted a series of very important new experiments using this instrument. Many of these were published in the Philosophical Transactions. As a result of his proficiency with experimental apparatus he became a kind of de facto curator of experiments at the Royal Society in c. 1704 after Robert Hooke’s death. In addition he seconded James Hodgson FRS to carry out public lectures on experimental philosophy in London while he acted as the demonstrator. By 1709 he himself was lecturing on experimental philosophy and continued this until his death in 1713. In 1709 he published a compilation volume of his air-pump experiments entitled Physico-Mechanical Experiments … touching Light and Electricity. This volume, in many ways, mimicked Boyle’s ground-breaking New Experiments Physico-mechanical touching the Spring of the Air (1660). (Even the titles are similar.) Hauksbee clearly saw himself as working in a tradition of experimental natural philosophy that extended back to Boyle. By now our readers should recognize the standard tropes of the experimental philosopher: the decrying of hypotheses; the likening of them to romances; the appeal to the necessity of experiment for the improving of natural philosophy. Hauksbee goes on in the Preface to mention ‘The Honourable and most Excellent Mr. Boyle’ and ‘the … Incomparable Sir Isaac Newton’ implying that he himself is engaged in the same natural philosophical project. It is interesting to note, however, that there is no mention of the method of natural history as practised and promoted by Boyle in the Preface or in Hauksbee’s work. Hauksbee’s experimental practice was a natural extension of Boyle’s work, but at the same time methodologically discontinuous with it. Hauksbee may not have had developed views on the methodology of natural philosophy or much aptitude in mathematics, but he was a gifted experimenter and a keen promoter of experimental philosophy.